I am currently in the middle of a move so my time has been short for the mascot rankings, next week is my target for the next league. 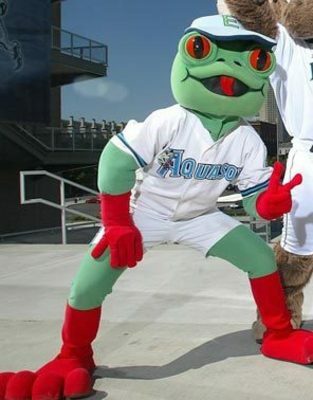 MiLB is running a mascot bracket tournament. 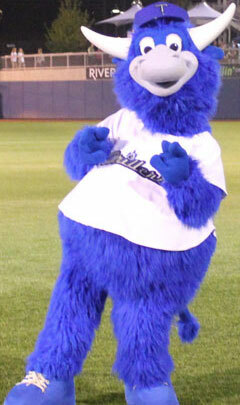 Please make sure to check it out at MiLB Mascot Mania. I don’t want to influence your vote…but Phinley in the South Division would love your votes! Also I want to invite performers to send in pictures of your dressing room! I want to see and share where mascots spend their down time. Email me at davidgdeas@yahoo.com with the subject line: Mascot Room. Hopefully I will get the South Atlantic League done early next week! 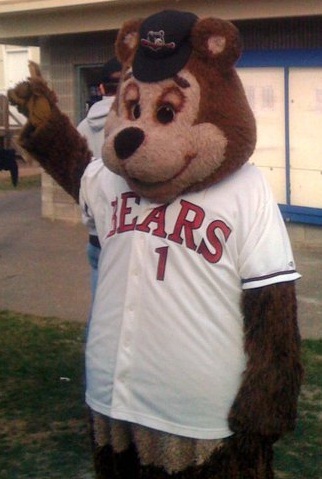 Welcome back to the 4th edition of Ranking Minor League Mascots! This week I tackle the Northwest League. This league hasn’t event started, it is a short season league but I could bear-ly contain myself. Out of 8 main mascots in this league 3 of them are cute and cuddly bears. I wonder if they ever get together for a jamboree? Joining the bears is a frog, a bird, a rare Spokanasaurus and then two that just defy description. Just like the previous leagues I have ranked according to creativity, exposure on team websites and basic subjective feelings. This is not a scientific poll by any means…because I am not a scientist. I am a mascot! Is he liquid hot magma? Does he do appearances? Does he beat fans with that baseball bat? I really don’t know. Not much info on the team website or facebook about Crater. However you can get him on your personalized credit card, So he has that going for him! Thanks to Captain Obvious on this ranking. Weather phenomena are hard to create as characters. Dusty here kinda of looks like an even more demented Stay-Puft Marshmallow Man. No web presence outside of a few pictures on the team’s facebook. If you want to help Dusty move up in the rankings here is your opportunity! I would love to know if he walks around the ballpark and just drops bags of dust on opposing fans! The first of the bears from the NWL! 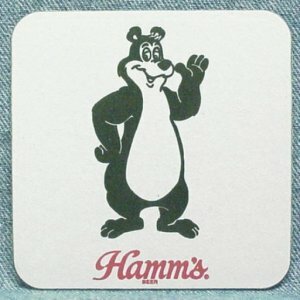 Boomer looks a little bit like the Hamm’s Beer Bear. He does have some merchandise in the team shop and a few pictures on the team website. What I would like to see is a biography. All mascots should have one. Your performer should also come up with character traits or a back story that informs how a mascot acts. Is Boomer a curious bear, a rambunctious one, what is his personality. Treat mascots as an actual entity and people will treat them as one. They go from being a ‘person in a suit’ to an extension of the team. Webbly is a fun looking guy. He has his own facebook with over 1,200 friends which is a plus in this league. I think they missed a golden opportunity to give Webbly a party favor tongue that he could stick out at people. Look at that wiener! Is that a two footer? This is a happy bear! Out in his community and spreading the word about the “C’s” Bob Brown has a great bio and hangs around with his friends the Sushi Mascots. I don’t know if Bob Brown Bear is named after this guy, but it would be pretty cool if he was! Send him and email: and say I said hello! bobbrownbear@canadiansbaseball.com. Wanna tweet a bird on twitter? Humphrey is on twitter during the season, so it is a short account but an account nonetheless. Here is a mascot tip for performers out there, WATCH YOUR HANDS! He is a really cool looking costume. A lot of attitude and personality. 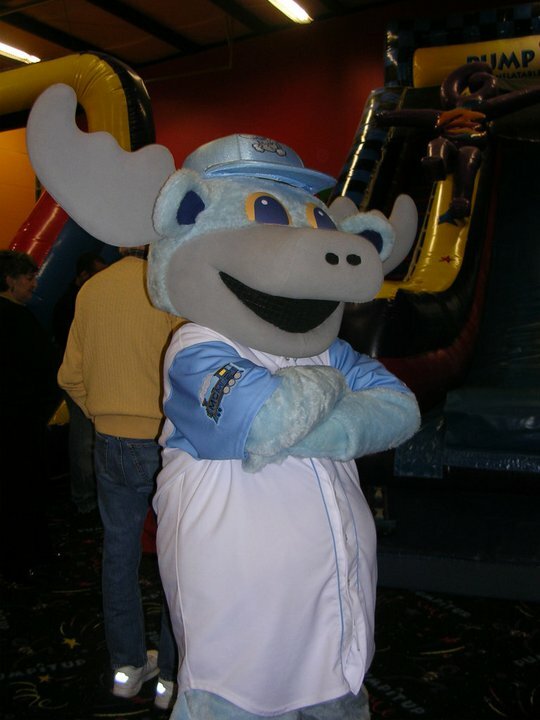 Humphrey is available for appearances, we have talked about mascots as revenue streams for minor league teams and they have different packages in Boise. As we get into the last two on the list it was a tough decision. Otto has a lot going for him. 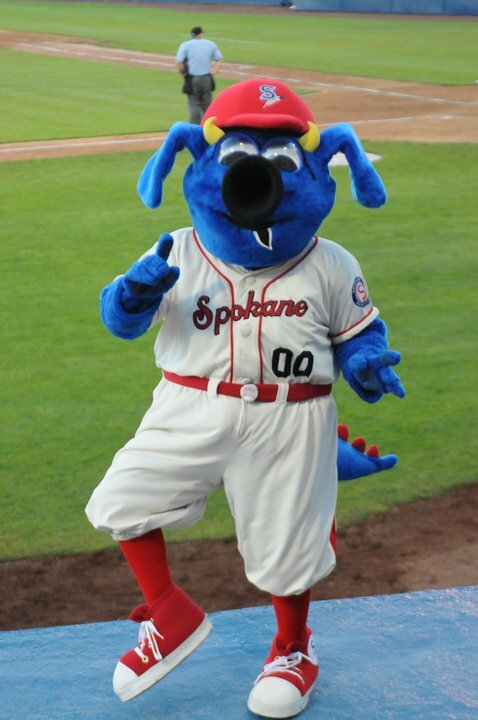 He is a ‘Spokanasaurus’, which I assume is a mix between an elephant, cow, dinosaur and maybe even a little Phillie Phanatic snout in there.. Great bio, a cast of characters around him, including Doris who is also a Spokanasaurus and Recycling Man who helps educate fans about recycling. another facet of this program is Super Otto, inflatable mascots are a great addition to any program. 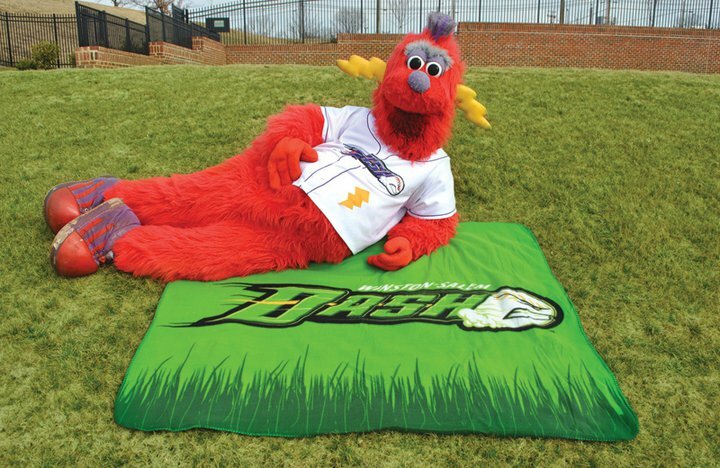 With the popularity of the ZOOperstars in minor league parks around the Country it only makes sense that teams create their own mascots in inflatable form. A great way to have Otto in two places at once if you get double booked. Seems like a great program out there in Spokane. Sluggo is the king of Eugene Oregon. At least it seems that way. I couldn’t quite place it as to why I liked Sluggo’s look so much until I saw this video and thought of Baloo the Bear from Disney’s The Jungle Book. It is so great to see mascots out in the community making those magic moments happen outside of the ballpark. He has his own facebook page and tons of info on the team website. The best picture however is HERE. I am jealous! I want to be Sluggo when I grow up! Well that is it for the Northwest League. I hope to have the next ranking up by the end of the week. I have a 6 game home stand this week so I will look at getting either the Pacific Coast or the South Atlantic League done this week. 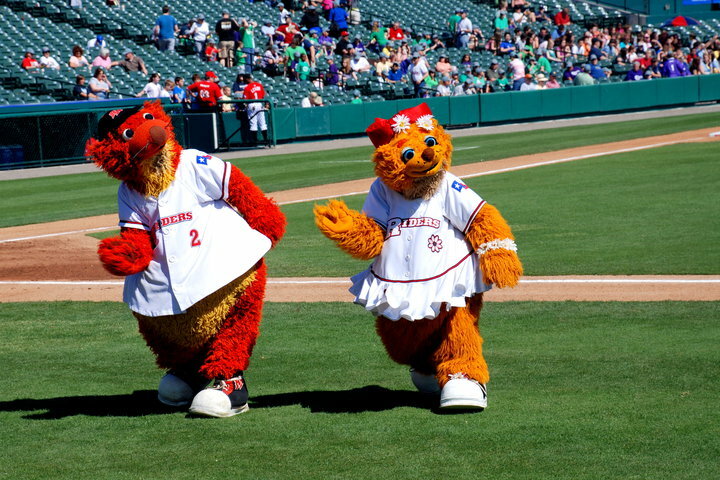 They say everything is bigger in Texas and in the Texas League bigger means more mascots! 4 out of the 8 teams have multiple mascots. This is a growing trend in Minor League Baseball. Being a performer sometimes it is lonely out there by yourself. Having another mascot buddy or even nemesis to play off of is a good thing. Just wait until we get to the Eastern League and the Reading Phillies. Until then lets focus on the Double A Texas League. Shelly? Because he is sponsored by Shell? I don’t mind a mascot bringing in revenue. In fact most General Managers of teams would love that extra income. Mascots should be a revenue stream, however to put the sponsor’s logo ON your mascot and naming the mascot after said sponsor? That may be a bit too much. Is he the sponsor’s mascot, or the teams? 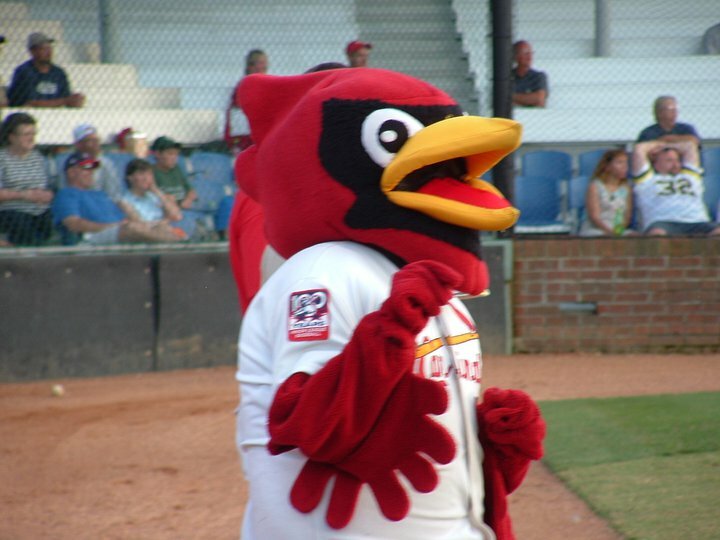 I think that all of the St Louis affiliates have old Fred Bird costumes lying around. I totally understand affiliate teams holding on to their Major League franchise names. 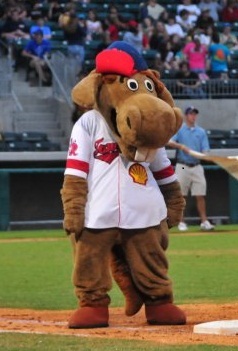 It is brand recognition…but this is the Minor Leagues, at least change-up the mascots, a little bit, please? They do have Fetch as the playful sidekick. No facebook presence that I could find. What a natural (pun intended) fit! Is he a Sasquatch or a wild-eyed crazy mountain man? The team website says he was found in the Ozark Mountains. He has a facebook with a very small following but he is a cool looking character. After viewing this photo though I don’t know if the girl is running for fun or for her life! Where is the hook? Is Rusty a hook? What I do like is that Sammy the Seagull is in charge of the birthday club and Rusty has the Kids Club. Double the mascots double the revenue streams! I just don’t feel attached to these two and no facebooks for fan interaction. This pair of prairie dogs has a lot going for them. Kid friendly and great looking costumes. As I said in the Applachian League rankings I like the focus on both genders for the kids. No facebook that I can find which is a common theme here in Texas. Brand extension should be a focus of mascot programs. There are so many ways to interact with your fans outside of the ballpark. Letting fans see videos on facebook is fun! His likeness is everywhere on Rockhound merchandise! This is the first case during my ranking that I have seen so much merchandise! Another great way to drive revenue through your mascot program. Rocky has his own ‘Rocky Town’ at Citibank Ballpark, presumably for picture and autograph opportunities for the fans young and old. These are just funny. A Ballapeno (who may be riding the puffy taco coattails) and a puffy taco..come on, what could be funnier? A pair of nuts? 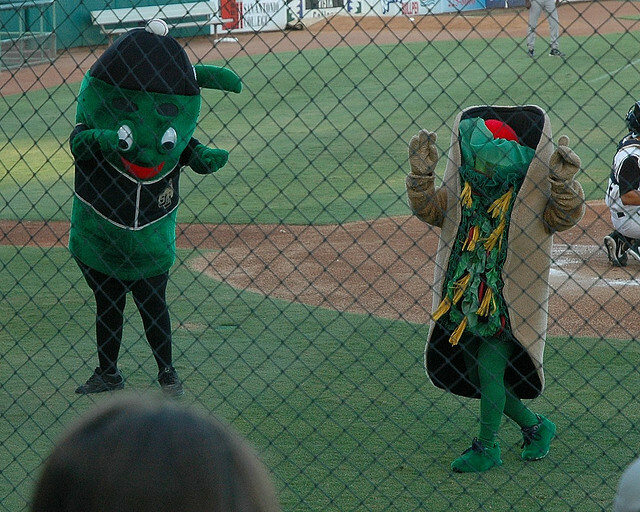 Personally I would feel a bit exposed in tights and half a jalapeno costume around drunk baseball fans. Props to whoever had the courage and maybe insanity to create these two mascots (and the performers inside of them). I know Henry is not an official Missions mascot but here is his facebook. He was recently named the 2012 Chips King! Ballapeno’s facebook is here. 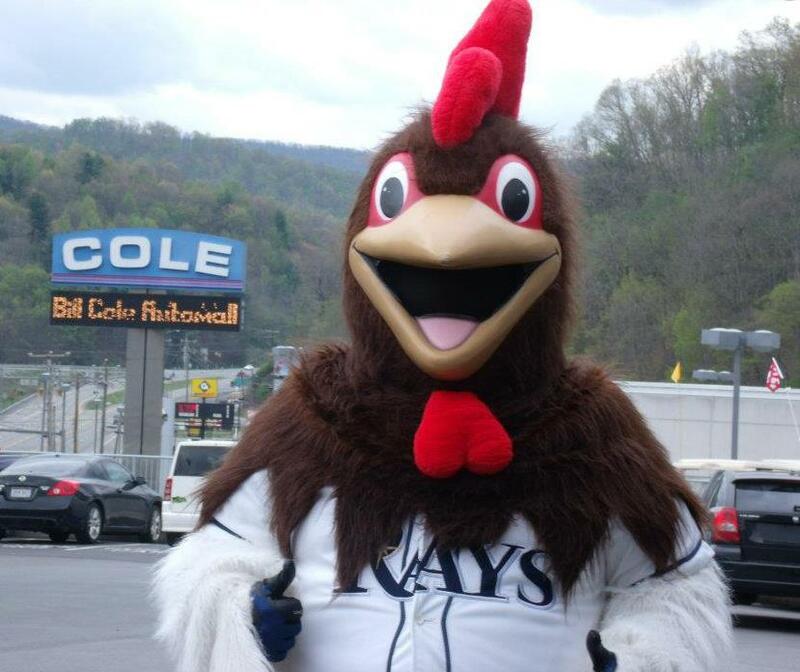 This may be the greatest mascot photo of all time per Benjamin Hill on his MiLB blog, and I have to agree. Hornsby has a lot of great videos online and a great look. This is another example of a great costume, a great committed performer and solid backing from the front office. I would just like to see a dedicated facebook page to this great mascot! Thoughts, suggestions, comments leave them below. Next it looks like we may be heading to the Northwest League! 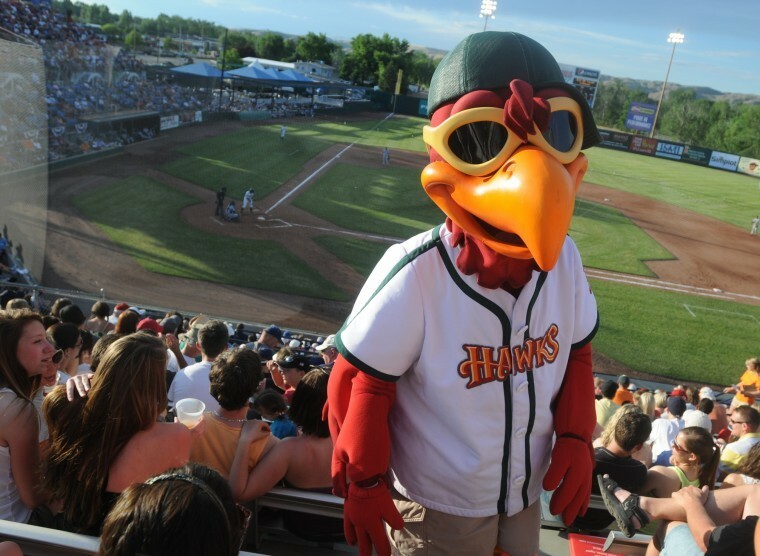 Welcome to the second edition of Ranking Minor League Mascots! In this post I will be covering the storied Carolina League. Consisting of only 8 teams I thought it would be easier to skip over the larger California league for now until I got my blogging legs underneath me! Just like the Appalachian League I have ranked according to creativity, exposure on team websites and basic subjective feelings. This is not a scientific poll by any means…because I am not a scientist. I am a mascot! Mugsy looks like he may have been partaking in his own rescue brandy! A little disheveled and in a too small jersey. I am sure kids love him but the total lack of a web presence on facebook hurt this guy’s ranking. What do I say about Uncle Slam. He would have been #8 had it not been for his facebook page. He is very patriotic and he has his own bobblehead so that counts for something! It appears he does double duty on the grounds crew as well! USA! USA! USA! 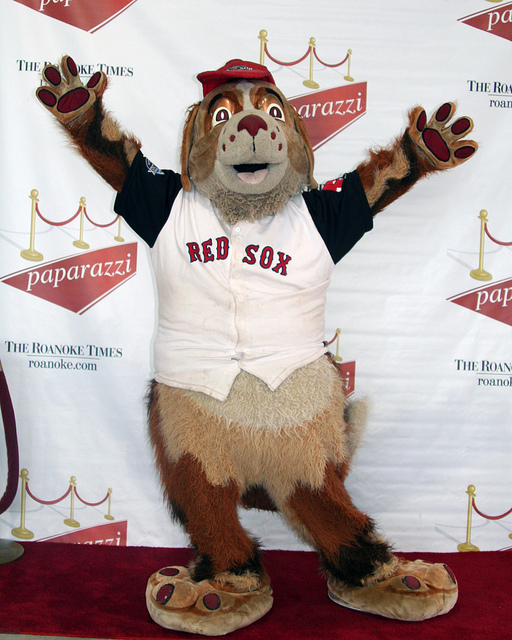 Southpaw is a hillcat, is that supposed to be a raccoon from Virginia? He could have ended up lower on the list due to his costume condition. 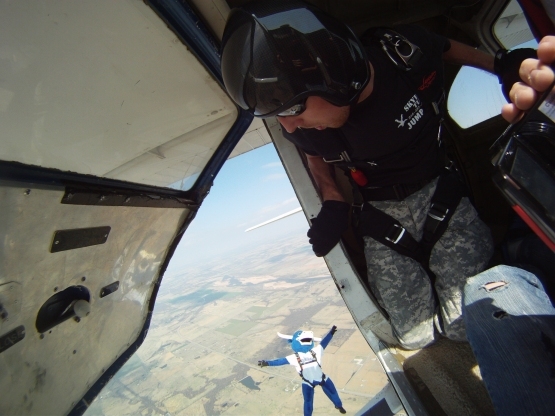 Remember, a mascot is one of the most important extensions of a team’s brand. However, he does have a small following on facebook and I found this video on youtube Beyonce’s Single Ladies. Cool name, great character…no facebook. I am hammering the internet section of my judging because brand extension is SOOO important. 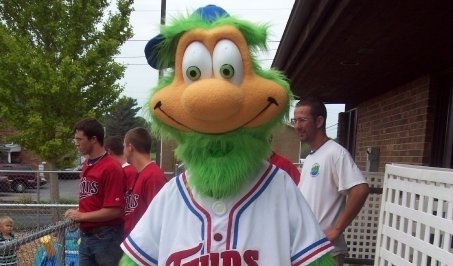 The mascot is the face of the Minor League team. Players come and go, mascots are forever…or at least a very long time. 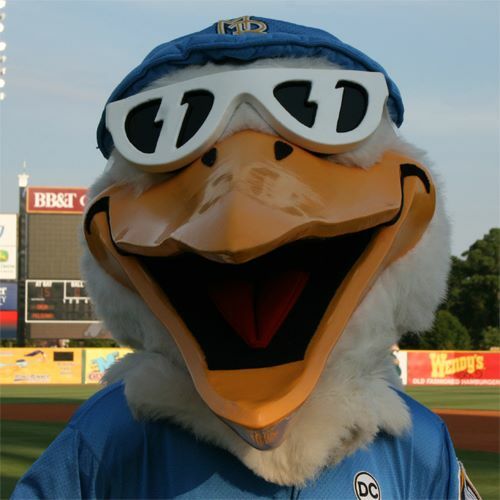 People who follow an MiLB team always know and identify with the teams mascot. In this age of facebook, twitter, google+ and whatever social media is over the horizon is so important. Bolt would have been so much higher on this list…if it were just for an online presence! Keys+Coyote=Keyote. Creative name, are there coyotes in Maryland? I guess there may be! This is Keyote’s 20th year in the league per his biography. 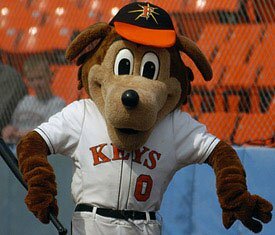 The motto in Frederick is “Shake Your Keys”, well hopefully Keyote doesn’t lock them in his van . Any mascot with his/ her face on a vehicle is pretty cool in my book. 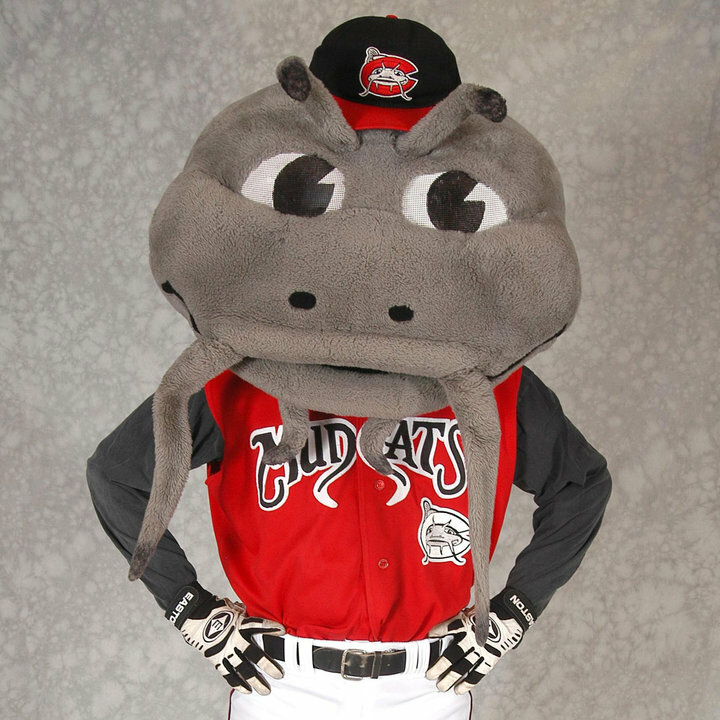 Mudcat=catfish and thankfully someone had the right idea to not name him the obvious Catfish Hunter. 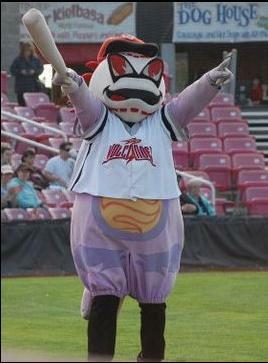 Though that would be a cool name for a ‘villain’ mascot at Five County Stadium. Muddy has a book club for kids, which is excellent. 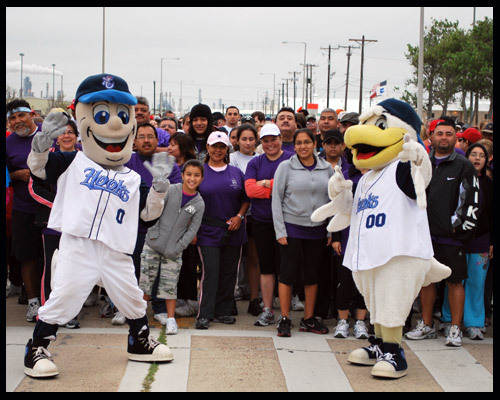 Being involved in the community is a big part of an excellent mascot program. That is one of the main reasons for him being at this ranking. His head is cool but the rest of the outfit is a bit basic. I wonder if his favorite food is noodles? I am fairly certain this is the ‘new version’ of the moose! I love the name, harkens back to the good old days of good cartoon programming! Moose and squirrel! I honestly liked the old look Rocky better but after realizing that he has a following on facebook of 4,300 people…looks matter not! 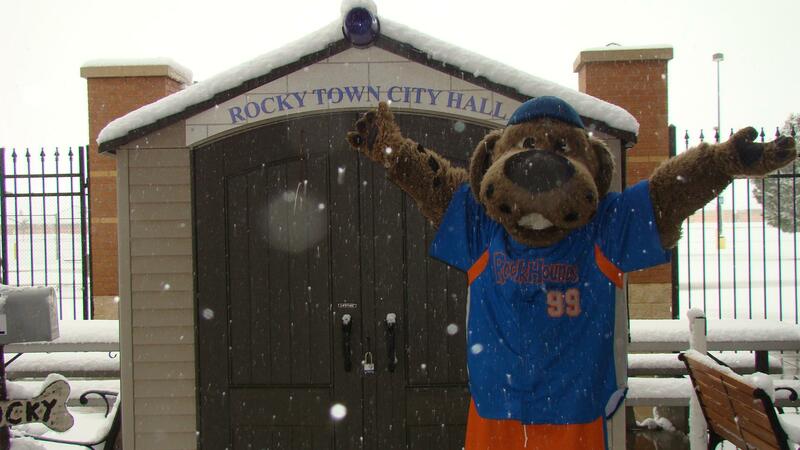 People in Delaware love Rocky and that is all that matters! Splash is a fun loving pelican. The team has really used him well in online videos and on Splash’s facebook with 5,500+ fans, It is a great costume that really evokes the Myrtle Beach life. Tons of community events and a great personality. As the Mascot Doctor always says, being a mascot is serious fun! 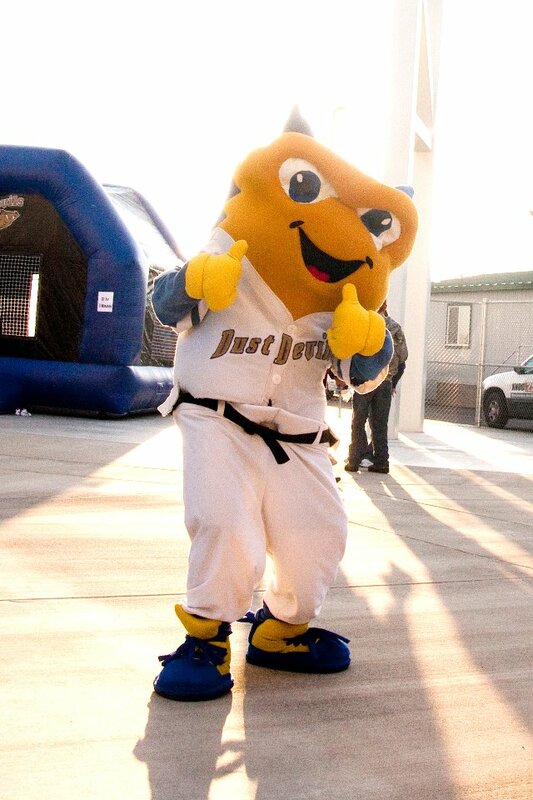 Taking a mascot program seriously benefits any team overall and in Myrtle Beach it definitely shows! I will be working on the next blog throughout the week. 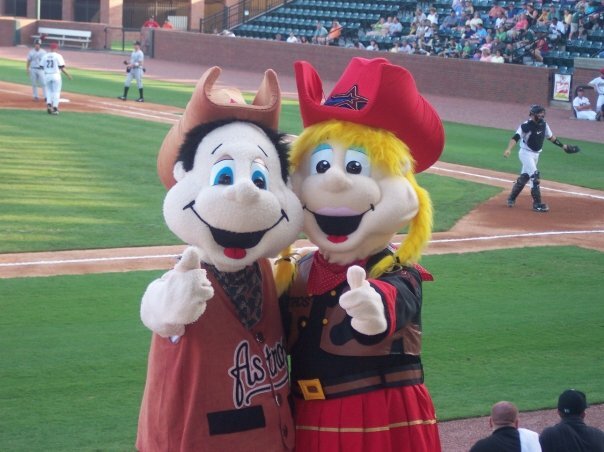 We will be heading down to Texas…they say everything is bigger in Texas…even MiLB mascots! If you have any suggestions for which League I should tackle next or have any input for a certain mascot leave a comment below! 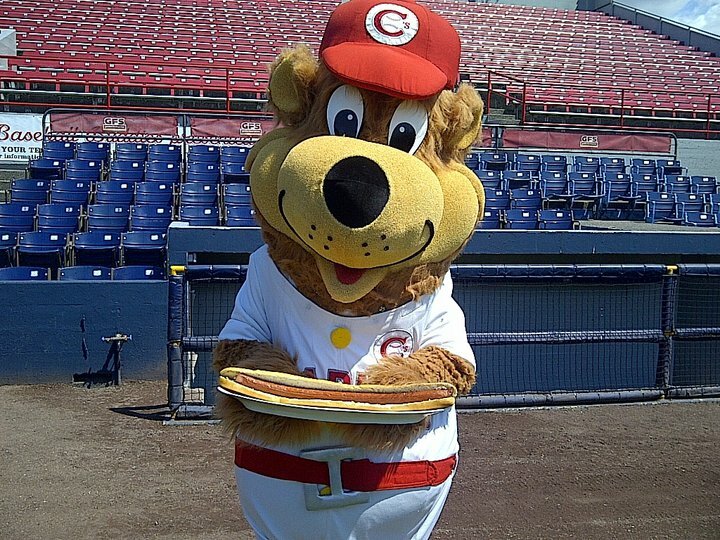 The purpose of this blog is to bring you news about mascots within Minor League Baseball. 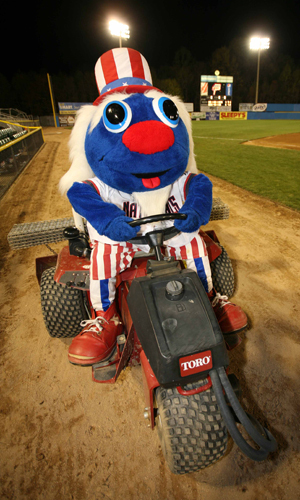 We will highlight the performers and help fans learn about one of the toughest jobs in baseball, mascoting. So how am I qualified to write this blog? Am I a writer? Not really. So hopefully those skills will improve as the blog moves forward. I am a mascot. I say that proudly. 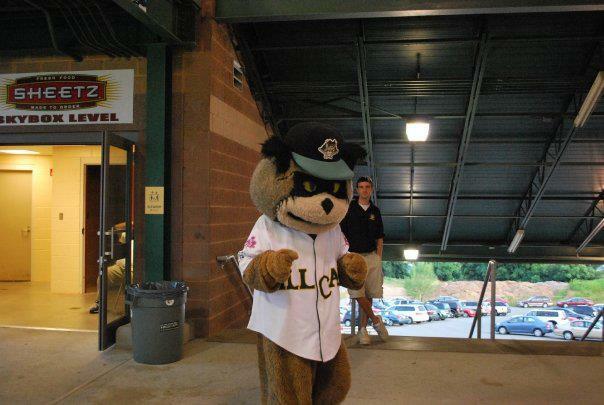 I have been a mascot in MiLB since 2001. I have been with only one affiliate during that time. I helped transition from an old stadium and an old character to a new stadium and new character in 2004. I have also been back up to many great MLB, NHL and NFL performers. I have performed for corporations, non-profits and private events. I have performed with the best of the best and seen the worst of the worst. 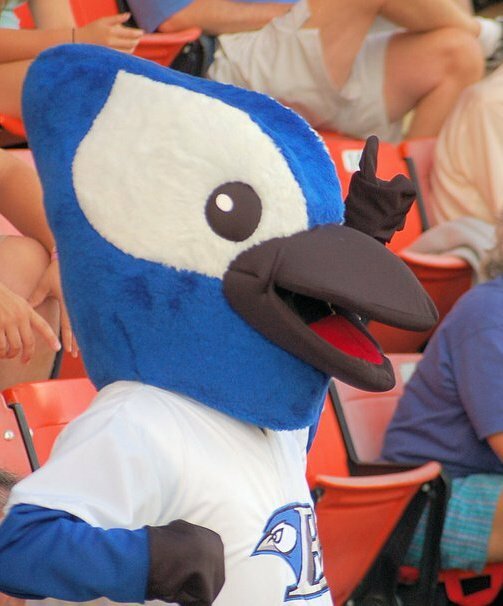 I always see the NFL, MLB and NHL mascots ranked and it got me to thinking…there are literally hundreds of mascots in MiLB and it is my goal to expose the programs and performers that create the characters that fans love (and sometimes hate). I have decided to start ranking mascots by league. Then eventually once each league is ranked we can cross over and start ranking overall mascots. So with that said I will start small and alphabetically so that puts us at the Rookie Appalachian League. I have ranked according to creativity, exposure on team websites and basic subjective feelings. This is not a scientific poll by any means…because I am not a scientist. I am a mascot! So let’s begin. 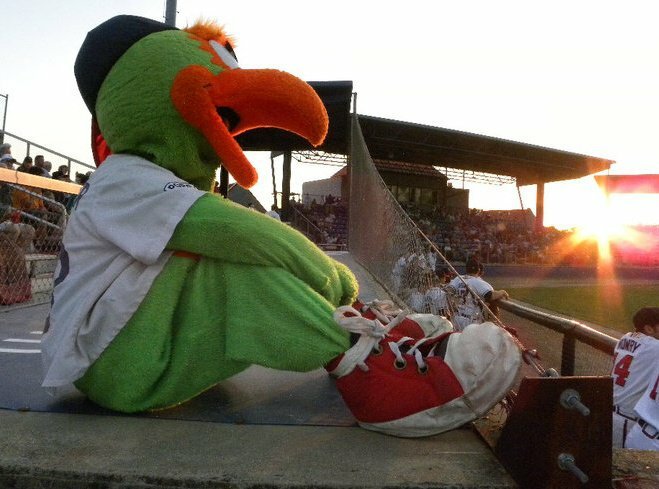 Out of the 10 teams in the Appalachian League I found only 7 mascots between team websites and a perusal of facebook pages. If I missed the 3 others let me know! UPDATE: I found another mascot from this league. Slider the Fox debuting at #7. There you go. The only picture on the team page taken from a birthday party flier. I am not even sure what he is. The baby brother of the Syracuse Orange? You sir, by default are number #7…because there is none worse that I can find online. I found this one another blog. The Mariners facebook had a few pictures of Slider but no name attached to him. Apparently he debuted in 2009. My affection for foxes (my first pro character) bumped him over Bingo. Well there is a little more creativity in Appalachia! Rookie doesn’t seem to have much to do with Twins but at least he is out and about in his community. He can be seen on the front page of his team’s website and that is saying something in this league. Yes I know that I just lambasted Blue Field for an expected character. But at least this guy has his own facebook page, 11 friends…but it is a start! He looks a little upset and angry. He may be scary to kids; then again we all scare some (even adults). In fact I always say that I need to at least scare one kid a game/appearance or I feel like I am not doing my job. These two rootin’ and tootin’ mascot siblings are pretty cool! Serve both demographics of girls AND boys. They each have a facebook page but it looks like Tex is slightly more popular. 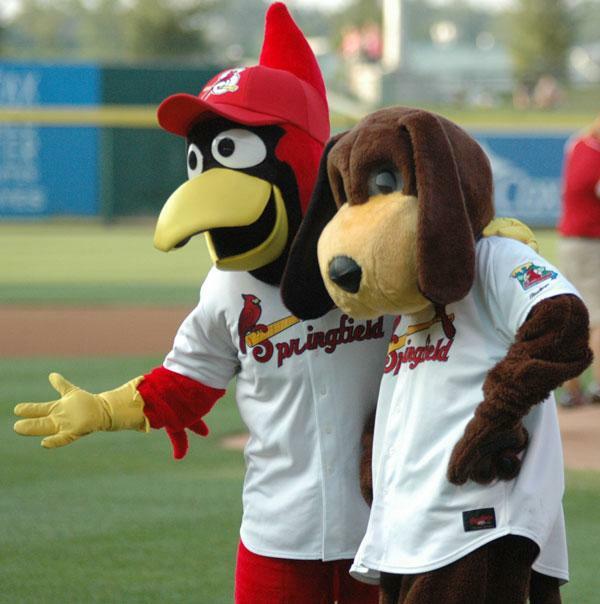 Having two mascots is always better than one. Right? They look like they are very kid friendly! Yeehaw! Next blog we will cover the Carolina League. Prepare to get Muddy!